So you're probably wondering where the post about the wedding is. I'm skipping it for now (check back and/or remind me about it later) because there are a couple nice (and clear) pictures of people who aren't me taken at the wedding (which is not a public place) and I'd like to have explicit permission from those people before posting those photos on the web. As the happy couple is currently on their honeymoon and I'm leaving town in not too many days, I thought it might be best if I wrote up the rest of the trip first. 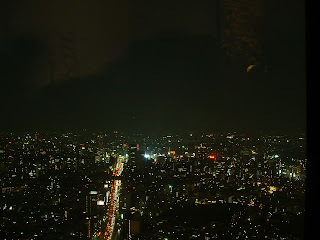 After stopping off at the hotel to change, we meandered toward Roppongi Hills (a giant shopping/restaurant/mixed-use building complex), to the Mori Art Museum, to which Kumiko had kindly provided us with some complimentary tickets. On the way, we happened to pass Tokyo Midtown, an even newer (the grand opening was the previous day), giant mixed-use building complex with the tallest building in Tokyo (this photo is the view from the bridge to the entrance of the main shopping building, I think). 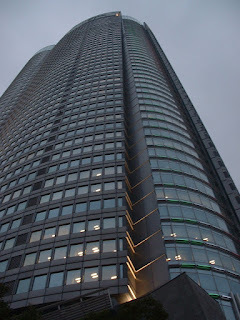 On the 52nd floor of the building there is an observation deck. We just happened to arrive at dusk, so I tried to get some nice twilight/night pictures. 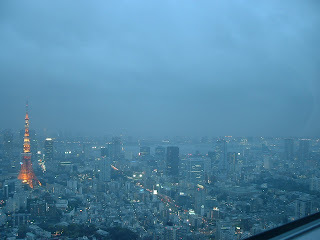 Here you can see Tokyo Tower to the left and Rainbow Bridge fading into the mist on the right. It was a little hard to get a good picture because there were lights behind me. In this shot, I think you can see the projected images of cherry blossoms on the wall behind me, where there was a nice seating area and live music. That bright spot near the middle is Shibuya, where they have an incredibly busy intersection -- the intersection that gets filmed to show how busy and full of people Tokyo is. Shibuya is also the location of a statue of a dog near one of the exits to the Shibuya subway station, which is a very popular meeting point for people. 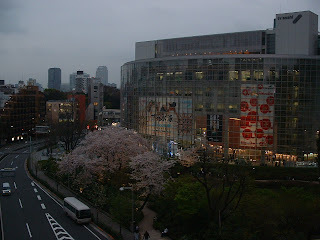 To the far right is Omotesando, an upscale shopping area. 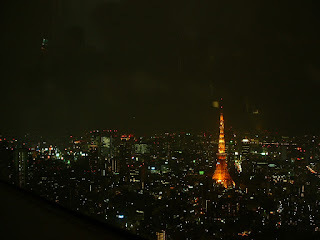 On the right you can see Tokyo Tower again and Ginza (the shopping area, there's a lot of shopping in Tokyo) on the left. The art museum (on the 53rd floor) was pretty interesting, with two different exhibits exploring the theme of laughter. By the time we got through them, we were all pretty beat and headed back, stopping off at a curry place for dinner. 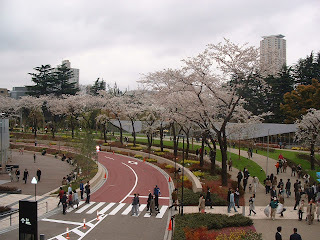 Back in Akasaka, they'd been blocking off streets all day for a marathon and a few other events (making getting to and from the wedding that morning a little tricky). The last event of the day was a draft horse race down the winding streets and up this steep hill (ending across the street from our hotel). We didn't wait around to see the races, but I caught one round on the TV. Two horses line up and behind each is a sled (not a cart, a sled). On the sled stands a driver and in front of the driver sits a passenger. I assume the passengers are local celebrities since they didn't seem to do anything but yell encouragement. The race seemed ill-advised and rather dangerous, as sparks flew from the bottoms of the sleds (I wouldn't think that was good for the asphalt) and the horses careened from side-to-side (I think at one point, one of the horses ran up the sidewalk).